A few days into our Rotary volunteer trip to the Dominican Republic, we witnessed a water fight. It didn’t involve hoses or spray guns or even water balloons, as you might expect. It was an argument between two mothers who were intent on ensuring their families had access to clean drinking water. We were delivering bio-sand water filters to their village, and one of the women thought it should be her name on the list, and not the other woman’s. At first they hurled insults at each other. They were speaking what sounded like a mixture of Spanish and Kreyòl, it was difficult to tell. All we knew for sure was that there was a lot of swearing going on. A young man named Wascar Pierre Luisima, who was working with us, calmly walked into the middle of the argument once the women got close enough to each other for the confrontation to escalate to a physical level. He talked quietly to them, then pointed in one direction for one woman to go, and another direction for the other woman to go. And off they went. One or two more insults were thrown, but the heat of the moment was diffused. 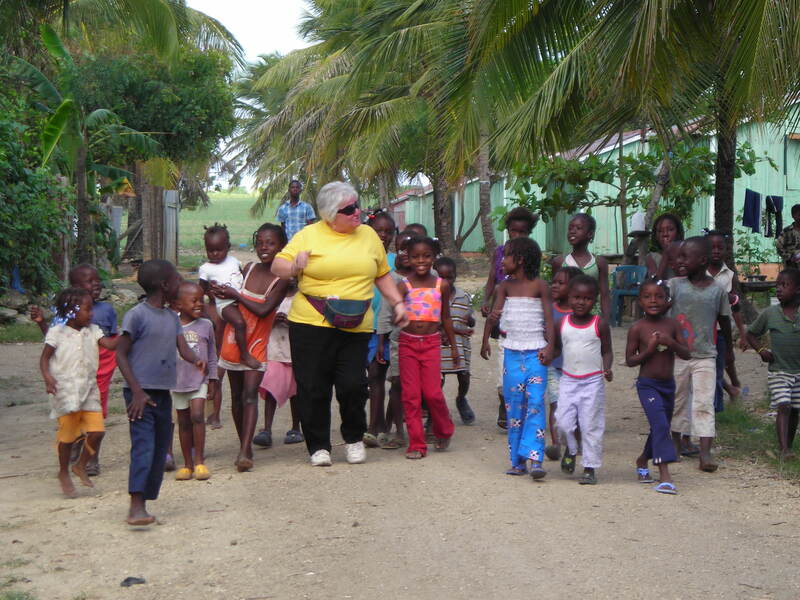 Sackville, NB, Rotarian Pam Harrison having fun with a group of children on the batey. Wascar (he told us his name is pronounced like NASCAR, but with a W) is 20 years old. He is a water technician helping to distribute thousands of water filters to immigrant Haitian families that live in the labour camps (called “bateys”) in the sugar cane fields of the Dominican Republic. He works all day in the bateys, and goes to school at night. He is studying Business Management – clearly his negotiation skills are already well developed. Wascar’s employer is the Good Samaritan Hospital in La Romana, DR. 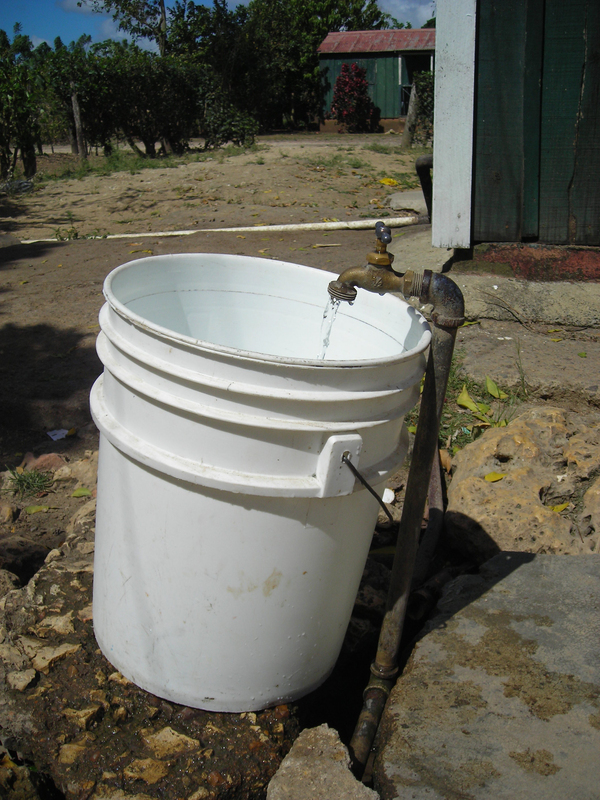 The hospital is the local distributor of the Hydraid® Bio-sand Water Filter, and the source of filters for clean water programs in both the DR and Haiti, including the International H2O Collaboration between Rotary and USAID. The hospital’s administrator is Moises Sifren Juan, a Rotarian who grew up on one of the bateys. The director of the hospital’s Bio-Sand Filter Program is Daniel Barett, also a Rotarian, and another night student; Daniel is studying Languages in his spare time. The warehouse at the hospital can securely store parts for up to 100,000 filters, along with the bags of gravel and sand necessary to make them work. Daniel’s job is to train the water technicians (there are currently three), and manage the distribution program. The filters currently in the warehouse were paid for in part by the Safe Water Team (www.safewaterteam.org), an NGO whose current Chair is Wendell Christoff, RC Lowell, MI, and a member of our team. Distribution of those filters is being paid for by Rotary Districts and Clubs, church groups, and individuals who make donations to the program through the hospital or one of the La Romana Rotary Clubs. More funding is needed. 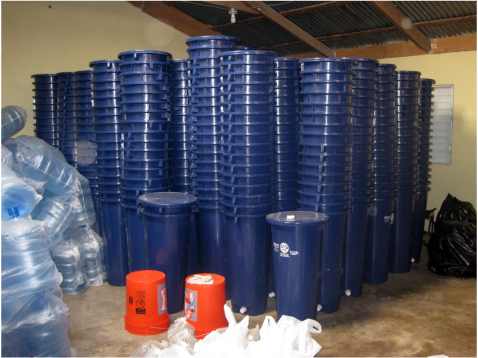 Water filter warehouse at the Good Samaritan Hospital, La Romana, DR. 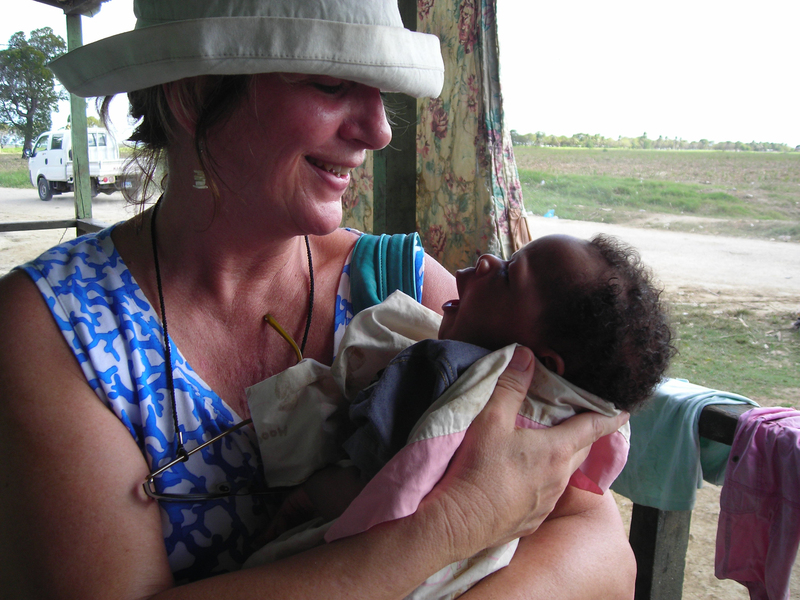 The Good Samaritan Hospital welcomes people of all cultures, and charges for its medical services, but because their mission doesn’t allow them to turn anyone away, even when they can’t pay, it has become known as the “Haitian Hospital”. Every year approximately 30,000 Haitians enter the DR illegally, to look for work and a home for their families. Many of these desperate people find jobs in the sugar cane fields where they are housed in very poor conditions on the bateys. The hospital operates medical missions to the bateys 40 weeks out of the year, ensuring that the Haitian families have at least occasional access to health care. 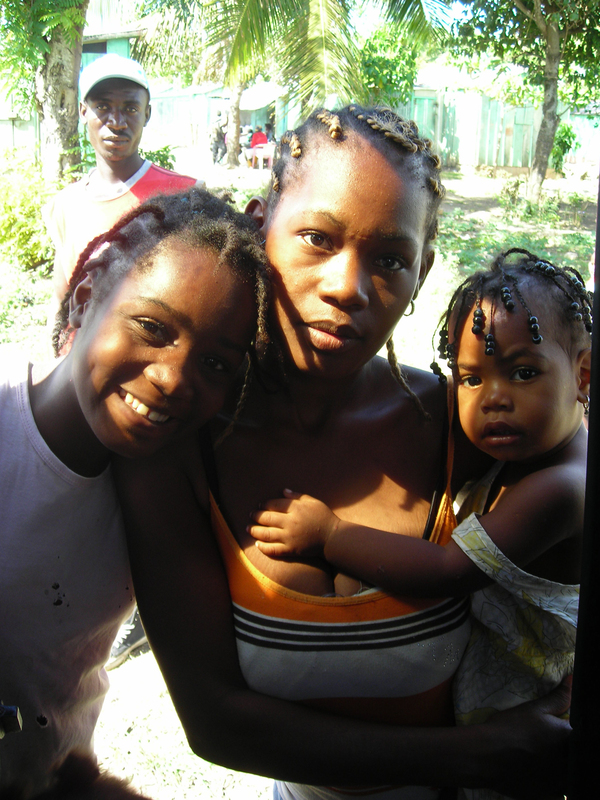 The number one medical treatment required on the bateys is for worms, which can cause severe malnutrition. A host of other illnesses caused by contaminated water are rampant. Which brings us back to the water fight. It’s a fight for clean water that plays out every day in the 400+ bateys in this country. In the La Romana region there are 150 bateys. So far, 15 of them have some water filters installed. Here’s how the distribution system works. The water technicians travel to the bateys daily. The trips take between 40 minutes and two hours. If the batey has a health monitor (a person paid about $40 per month to monitor the health concerns of the village), they enlist their help to call a “town meeting” in the church or schoolhouse. They use an image-based presentation (at least 30% of the people are fully illiterate) to describe the relationship between clean water and good health, and how a water filter can help. The presentation takes about an hour, and includes a question-answer session. Following that, families may volunteer to have a bio-sand water filter installed in their home. Their names go on a list, and the filters are installed at a later date. Chris Parker, from Sackville, NB, the only team member who has never been a Rotarian. Her father was a Rotarian and a Paul Harris fellow, and Chris is already signed up for next year's trip! Right now the focus is on installing filters in the homes of people who want them. In the future, the focus will shift to further education, to convince abstainers of the need. In the meantime, it becomes clear that families using the filters are enjoying better health than their neighbours, so convincing the abstainers becomes less and less difficult. On installation day, the water technicians load filter parts and gravel into their truck and head out to the batey. Each filter system includes a plastic container with a water diffuser plate and lid, a PVC collection pipe, a plastic spout, two grades of gravel, and sand. This very simple system, developed by Dr. David Manz at the University of Calgary, basically imitates the natural filtration system of ground water. At the bottom of the container is a layer of coarse gravel, followed by a layer of fine gravel, followed by a thick layer of sand. Within three days of installation, the filter will remove large microbes like parasites, and after thirty days, up to 99% of the bacteria, viruses, worms, etc., found in the local sources of water (usually piped from nearby rivers). If the sand layer is undisturbed, it will effectively filter as many as 60 liters of water an hour for as long as ten years. Each filter has a serial number tag, which secures the lid to the container, so it can be traced. Our international Rotary team included Wendell from Michigan, nine Rotarians from New Brunswick and Maine, two Rotarians-at-heart, and our team leader, Dr. Bob Chagrasulis, RC Calais, ME, a trauma surgeon who has lead medical missions to the DR for 20 years. 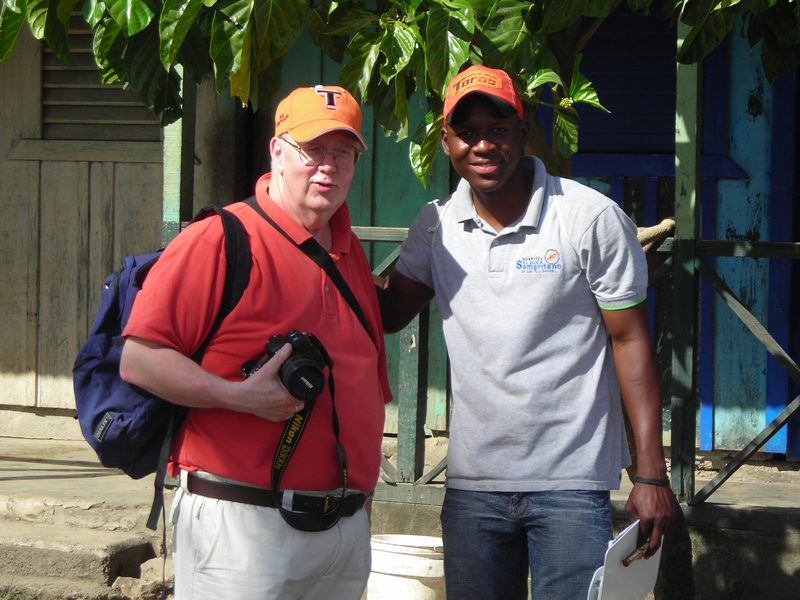 Dr. Bob is the Water Coordinator for Rotary District 7810 and the author of our current District Project to distribute 60 water filters in the DR, fund the purchase of a delivery truck, train more water technicians, and to hire “water promoters” on selected bateys. Our team’s intention was to assist the water technicians and install as many filters as we could in a week. We installed 53 filters in 4 days. (The weekly average is 15.) Needless to say, we were proud and honoured to participate in the project, knowing that we were helping to improve the physical health of 53 families in the process. On our second day on the bateys, several of us were already committed to returning in a year to do it all over again. A typical water source: water piped in from a nearby river. The water is untreated and the tap works intermittently. Once a filter is installed, the water technician spends about 30-40 minutes with the family, collecting information for the file, and making sure they understand how to care for the filter, and how to prevent re-contamination of the filtered water. They are educated further about the importance of using filtered water for everything, including drinking, cooking, house cleaning, and bathing. Several weeks later the water technicians return to the batey to ensure the system is being used correctly. In the meantime, the local health monitor keeps an eye on things. (A future goal is to appoint a water monitor for each batey.) If a family is required to move, which happens often, they can take their filter with them. Although this disturbs the sand layer, it will function properly again within three days of being moved. It has been almost a month since our team returned from the Dominican Republic, and it is still difficult to put the experience into words. Learning to assemble and install the filters was actually the easy part. The real challenge was dealing with the overwhelming poverty on the bateys. Every day we were surrounded by children, playful and devious, curious about what we might have in our pockets and backpacks. We visited their one-room schoolhouses that go to either grade 4 or 6, and left learning and play materials behind. One day we helped to distribute bicycles and shoes that were sent to the DR by the Rotary Club of Rothesay-Kings, NB. No matter what we left behind though, it amounted to only a temporary diversion from reality for the hundreds of children we met. While we can be assured that a few of the families now have clean water to drink, we know that there is much more to do to provide all the basics necessary to improve their condition, such as better nutrition (they can afford to eat only once a day) and increased access to education. Suffice to say, there is a lot of work we can do help improve the lives of people in the Dominican Republic, particularly the Haitian immigrants. We hope that this trip will be the beginning of a long-term commitment by Rotary District 7810 to serving with our Rotary colleagues in the Dominican Republic. Milagro (centre), a young mother who helped us translate some English word into Spanish, by way of French, which shares some vocabulary with Kreole. The name Milagro means “miracle”. Girls start families about age 14; many have several children by the time they are 20. Moises, the hospital administrator who grew up on a batey, told us that our presence in the DR was significant. While we might feel that we could never do enough, he said that the people sincerely appreciate knowing that someone cares about them. He told us that when we were out on the bateys, we should think of every child we met as another “Moises” – a child that, with the right influences, could be inspired to finish school and go on to higher education, and maybe one day run a hospital that is dedicated to coming to the aid of anyone who wanders in and asks for help. « Do Dreams Come True? I just returned from this same trip, though my company. It was life changing – just as you said. You put it very wonderfully in this write up. Moises, Danielle and the team are OUTSTANDING! Rotary builds protected springs in Kenya.